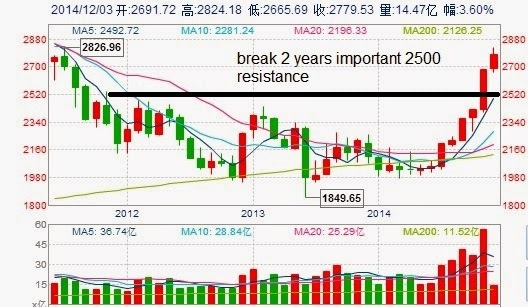 Daniel Loh: Shanghai Composite may run to 3300-3400 next year, followed by one year of consolidation! Shanghai Composite may run to 3300-3400 next year, followed by one year of consolidation! We did talked about the start of the bull market if Shanghai Composite can break that 2500 barrier this year. Ever since the breakout of 2500, the composite has been extremely bullish. 2) This is the first phase of bull run. In first phase of bull run, it seems like almost every month rise. Occasionally there may be one month down. Every time it is down on that month, make sure you buy. First year of bull run, the index will not fall much. 3) This bull run started in July this year after the government implement some so called mini-stimulus. It is a hidden fact that they printed money to stimulate the economy and stock market. Just that the government did not announce it publicly. Printing money works wonders again, this run is just like Japan Nikkei last year. 4) This almost every month bullish run should continue to June 2015, and after which Shanghai composite will correct strongly! My prediction is that this run will halt in June next year. Be careful of the sharp drop. We will then enter the second phase of bull run, where not every month runs. 5) Be careful of 3300-3400 next year! This is where Shanghai composite might hit the brickwall. A must sell area for mid term investors. Wait for a correction of 15-20% in the index. 6) Best sector to invest now is Banking sector, most likely will increase 2 times from now till 2016. May also select those high dividend blue chip stocks. Shanghai Hongkong connect provide us with a good chance to pick them up. Coming June next year, we shall see if my predictions come true.